Founder, Jaya Murti sojourned to Japan on January 1st, 1940. Jaya was the third of four brothers and a sister. He was working as an electrical engineer after graduating from technical college in Bangalore. Eldest brother, Rama Murti, who was secretary to the then King of Nepal, fell in love with Japan in 1932, visiting in transit on their way back from attending the World Conference of Religions. At that time hired an interpreter, Miss Yoko Sakai, it was love at first sight. Rama soon returned to Tokyo, established a trading company and married Yoko, later named Geeta. During that time, Rama was appointed by Indian freedom fighter, Netaji Subhas Chandra Bose to act as Chairman of the Provisional Government of Free India, Japan chapter and was very active as liaison with the Japanese government and supporting the Indian National Army training in Japan. Rama called Jaya to study in Japan, who soon enrolled at Tokyo Institute of Technology and also worked for Indian freedom movement. August 18th, 1945, Netaji died in a plane crash soon after takeoff in Taiwan. His cremated remains were brought to Tokyo by the Japanese Military and was received by Rama and Jaya. Confiscation by the occupation Allied Forces must be avoided, because Netaji was considered war criminal by the Allied Forces. After much thought, the brothers decided to separate the ashes and kept a part in safe keeping at their residence and a part temporarily hiding at a nearby Buddhist temple called Renkoji. Knowing that the remains should not be with them, Rama flew to Delhi in 1953, to report to Prime Minister, Jawaharlal Nehru. But general trend of the people of India refused to accept Netaji’s death. Rama and Jaya were not able to return the ashes. Rama never returned to Japan. (Later, on Prime Minister Nehru’s Japan visit, Jaya gave a briefing). In 1947, Jaya married Rama’s wife’s younger sister, Atsuko. Upon marrying a foreigner, Atsuko, became stateless and was much later granted Indian citizenship and was named Sujata Shanta Murti. One day when the two couples were still together, Jaya got hold of chicken and cooked a home style curry. Sujata was struck by experiencing taste of the spices for the first time. This is how Ajanta’s Chicken Curry was born. Sujata strongly wished to spread this taste, unknown to the Japanese. 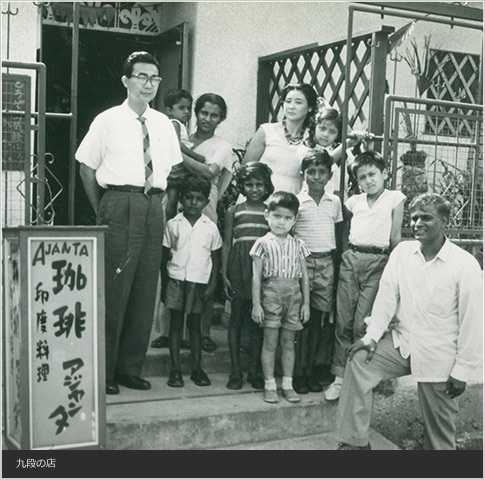 And…in 1957, “Curry & Coffee AJANTA” started at Asagaya, Tokyo, residence. 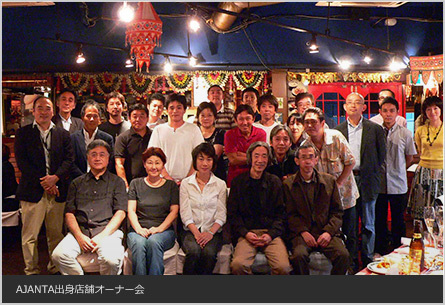 During those days genuine Indian currys were available at a very few restaurants, as at the Nakamuraya in Shinjuku. Ajanta’s chicken curry also gained immediate popularity. Word of mouth spread and Ajanta’s fan increased. 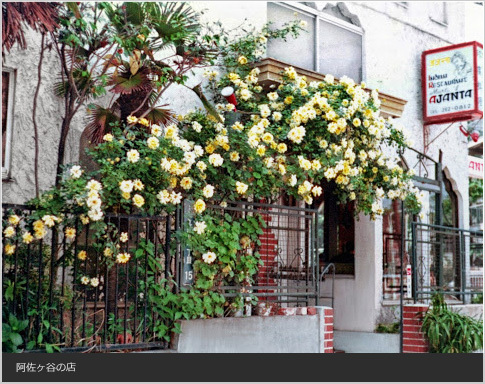 In 1961, the Murt’s moved to Kudan and with 120 seating restaurant, business flourished. Later when Indian Embassy moved in the vicinity, many Indians visited “Ajanta” not only as a restaurant but as a salon of getting together owing much to the personal hospitality of Jaya and Sujata. Now the restaurant operates in the Kojimachi district. Indian restaurants are found in every nook and corner of Japan, over a thousand in Tokyo alone, Indian cuisine has evolved into one of favorite foods among Japanese. “AJANTA” will continue with the heart and taste of Jaya & Sujata and respecting Rama & Geeta’s spirit and dedication towards India. Note: In 2005, Netaji's remains kept with us were taken to India by Prof. Sugata Bose,director of the Netaji Research Institute, Kolkota. 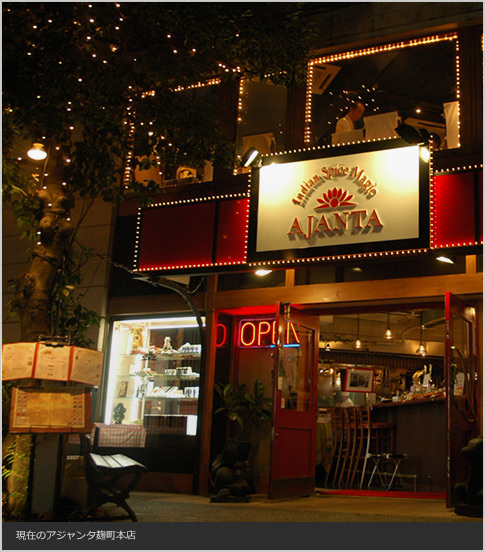 Wishing to run a full fledged authentic Indian restaurant, AJANTA moved from Asagaya district to Kudan in 1961. Uncompromising to create genuine cuisine, in the days when spices were difficult to procure, Jaya procured cloves, cinammons, etc, from Chinese medicial stores. Jaya insisted on whole spices, grinding and blending them just as his mother did back home. Even after more than half a century, his recipe is strictly observed. With the advent of high economic growth after the 1964 Olympics games in Tokyo. AJANTA enjoyed its 120 seatings full house everyday, lunch and dinner. And even now, in Kojimachi In "Ajanta"
And now at AJANTA Kojimachi In 1984, the restaurant moved to Kojimachi district and opened as a 24 hour, open everyday, authentic Indian restaurant. (After the Great Eastern Japan Earthquake, business hours are now Sun & Mon, 10h to 24h & Tue thru Sat, 10h to 28h). But even now charcoal in the tandoor oven stays burning 24 hours, maintaining constant temperature is a key factor for baking breads and broiling meets. Ofcourse our currys dearly loved by our clients has not changed since biginning. Lunch, dinner, parties, midnight eatouts, bentos, catering, online deliveries... Keeping with the tradition of Murti's hospitality, just as the our curry was first introduced, we endevor to bring more culinary delights unknown to Japan. Many chefs apprenticed at AJANTA running their own establishments Many service and kitchen staff, even college student part timers, who were enamored with the world of Indian cuisine, have spread all over the country, opening their restaurants. They meet regulary for a friendly get together, reminiscing their good old days at AJANTA. Copyright(C) PRANCE CORPORATION, INC. All Rights Reserved.